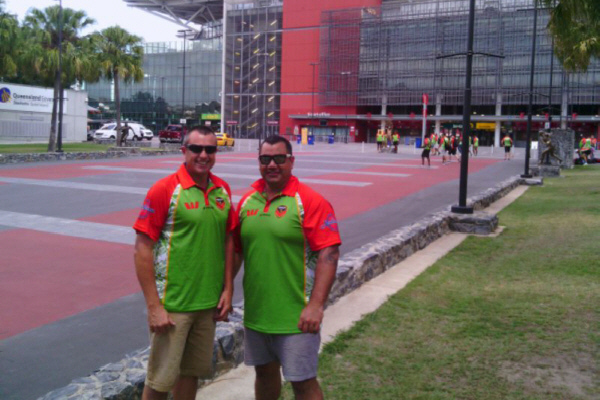 Santo product and Vanuatu test prop Herby Henderson led from the front for the VRL Invitational side against the Sunshine Coast Falcons in the match at Suncorp Stadium on Sunday. In a match where the score line didn’t represent the closeness of the contest Henderson was a stand out. His strong charges constantly threatened the line and he was rewarded with a try late in the first half. He also pulled off some absolute bell ringers in defence forcing at least two Falcons players from the field. Herby isnt the only big hitter in the family, he was joined by two of his cousins Alfie Henderson and Anthony Delavuna who were also outstanding for the VRL invitational side. The boys will now turn their attention to VRL fixtures later in the year . Follow us on facebook or watch this space for more info on up coming promotions and events. This entry was posted in Uncategorized on March 3, 2014 by Vanuaturl.